As the mobile wallet space and frictionless payments for consumers continues to explode, socially charged entrepreneurs are starting to explore using that technology for good. Specifically, socially conscious startups are starting to embrace technology, and mobile technology to facilitate charitable transactions. Last week in Memphis Tennessee, Pam & Tom Cooper launched their startup Boosterville, out of the Seed Hatchery accelerator program. Boosterville embraces mobile technology, incorporates loyalty, rewards, mobile payments and fundraising, all in one easy to use app. Now we drive up the road to Danville Kentucky where Brock Klein along with Brushfire Interactive started Givr. 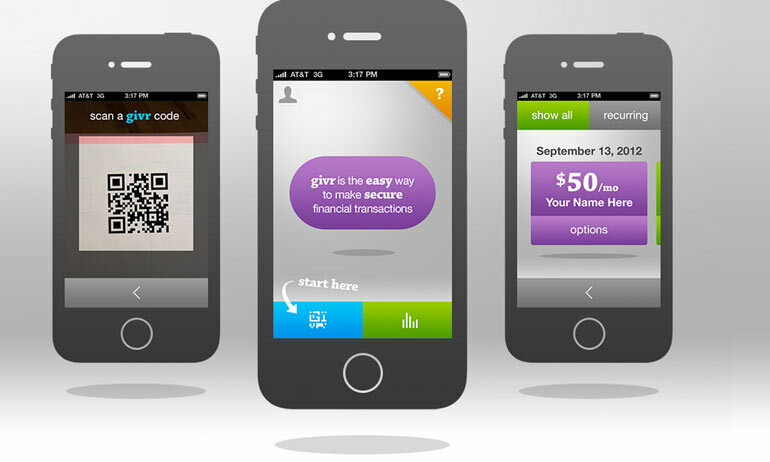 “Givr is a native iPhone payments application dedicated to helping charitable organizations achieve their giving goals. The Givr app provides users with an elegant, frictionless giving experience that dramatically reduces the time and stress associated with mobile giving.” Phoenix based Brushfire’s Brandon Clarke told us in an interview. The logic here being that as it gets easier to actually donate money to a cause or charity, more money will be donated. This has been shown time and time again when natural disaster’s have struck and the Red Cross has mobilized donations via text message. With the simplicity of using a mobile phone to quickly donate money, more money comes in. Check out the rest of our interview with Givr below. Givr was founded out of a passion for technology and philanthropy by Brock Klein. After studying economics and statistical analysis at Centre College in Kentucky, Brock worked in the financial services industry. His evolving interest in digital development led him to Phoenix, Arizona based BrushfireInteractive, where he worked as project manager. With the support of Brushfire’s founder, Gabe Cooper, Brock began to refine the scope of Givr and development began in the Fall of 2012. What is the startup culture like where you are based? Nascent. Startups have been coming out of Kentucky for a while but the community is just beginning to get connected and evolve. What problem does your startup solve? Remove the friction with routine giving. Don’t have cash on you? Don’t have a checkbook? Not in front of your computer? You can still give to a cause or organization important to you. What is one challenge that you’ve overcome in the startup process? One of our greatest early challenges was defining the scope of the project, balancing big dreams with a lean launch. What are some of the milestones your startup has achieved? Our first milestone was closing our seed round of financing, catalyzing our development process. Our biggest milestone was launching our iOS app in the App Store. Our next milestone is 100 nonprofit organizations adopting our platform with at least 1,000 users (Givr’s) using the app for their routine giving with these organizations by the end of the year. Who are your mentors and role models? We wouldn’t be where we are today without the mentorship and counsel we’ve had. One of our early investors, First Southern National Bank, has consistently given invaluable counsel – particularly the chairman and founder, Jess Correll and the Director of Culture and Outreach, Dan Lewis. Gabe Cooper and LorenKutsko of Brushfire Interactive have also given consistent and indispensable advice and insight into the mobile giving space. Finally, Brian Crall, an executive coach and successful business leader, consistently points us in the right strategic direction. What are some of the advantages/disadvantages growing your startup outside of Silicon Valley. Quiet. We’ve been able to put our heads down and focus on our product and our mission. We’ve had all the benefits of top line expertise without any of the noise. What’s next for your startup? We’re moving into the broader launch of our platform. “How can we help people express their generosity through mobile?” Wherever that answer leads is where we will go. People can see our product at www.givrmobile.com. Startup America and Startup Weekend have merged, story here.